As a highly successful, award-winning scale marketing program in Canada, Kraft Hockeyville has awarded more than $1.6 million towards local hockey arena upgrades to more than 40 communities over the last eight years. Kraft Hockeyville will now bring together a roster of all-star partners in the United States, including NBC Sports Group, the National Hockey League Players’ Association (NHLPA), the National Hockey League (NHL®) and USA Hockey. Hockey arenas, like all sports facilities, are the gathering place for communities, where kids go to learn, play and compete. Hundreds of thousands of kids who enjoy the ritual of local and youth hockey at thousands of local arenas will have an opportunity to share in the excitement of this one-of-a-kind competition. This unique, fully integrated scale-marketing program will include TV, digital and in-store media support. Many U.S. retailers activate in-store promotions during hockey season and the launch of Kraft Hockeyville will help enhance their connection to hockey and their local community. The participating Kraft brands will include A1, Bulls-Eye BBQ Sauce, Cracker Barrel, Jell-O, Kraft Mac & Cheese, Kraft Mayo, Kraft Natural Cheese, Kraft Salad Dressings, Kraft Singles, Maxwell House, Miracle Whip, Oscar Mayer, Philadelphia, Planters, Stove Top and Velveeta. In addition to Kraft Hockeyville, the newly expanded agreement makes Kraft an Official Sponsor of the NHL and the NHLPA in North America and an Official Partner of the NHL Winter Classic®, NHL Stadium Series™, NHL® All-Star Game, NHL Heritage Classic™, NHL Face-Off™ and the Stanley Cup® Playoffs. Kraft brands will also enjoy sponsorship exclusivity in more than a dozen food and drink categories, including Roast & Ground Coffee, Cheese, Snack Nuts, Enhancers, Packaged Cold Cuts, and Desserts, among others. 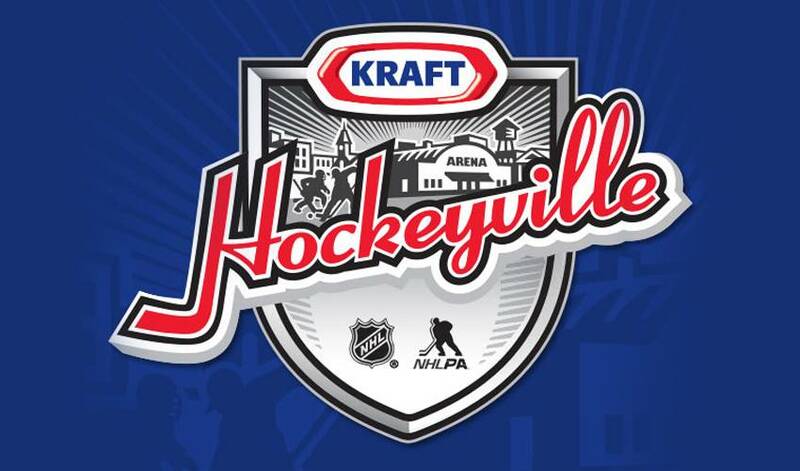 The puck will drop for Kraft Hockeyville in the U.S. with nominations beginning on January 1, 2015, during the Bridgestone NHL Winter Classic featuring the Chicago Blackhawks and Washington Capitals. Community nomination and contest details will be released in the coming months on www.krafthockeyville.com. NHLPA, National Hockey League Players’ Association and the NHLPA logo are trademarks of the NHLPA. © NHLPA. NHL, the NHL Shield, the word mark Stanley Cup and NHL Winter Classic name are registered trademarks and NHL Heritage Classic name and logo, NHL Stadium Series name and logo, NHL Face-Off name and logo, are trademarks of the National Hockey League. All NHL logos and marks and NHL team logos and marks depicted herein are the property of the NHL and the respective teams and may not be reproduced without the prior written consent of NHL Enterprises, L.P. © NHL 2014. The National Hockey League (NHL®), founded in 1917, consists of 30 Member Clubs, each reflecting the League’s international makeup with players from more than 20 countries represented on team rosters, vying for the most cherished and historic trophy in professional sports – the Stanley Cup®. Every year the NHL entertains more than 250 million fans in-arena and through its partners on national television and radio; more than 10 million fans on its social platforms; and more than 300 million fans online at NHL.com. In Canada, the 2014-15 season marks the beginning of a landmark 12-year broadcast and multimedia agreement with Rogers Communications, which includes national rights to NHL games on all platforms in all languages. In the U.S., the NHL is in the fourth season of its 10-year agreement with NBC and NBCSN, the 10th consecutive season both networks have served as national television partners. The NHL is committed to giving back to the community with programs including: Hockey is for Everyone™, which supports nonprofit youth hockey organizations across North America; Hockey Fights Cancer™, raising money for local and national cancer organizations; NHL Green™, which is committed to pursuing sustainable business practices; and a partnership with the You Can Play Project, which is committed to supporting the LGBT community and fighting homophobia in sports. The NHL received three 2014 Sports Business Awards: “Sports League of the Year,” “Sports Executive of the Year” recognizing Commissioner Gary Bettman, and “Sports Event of the Year” for the 2014 Bridgestone NHL Winter Classic®. For more information, visit NHL.com. The National Hockey League Players' Association (NHLPA), established in 1967, is a labour organization whose members are the players in the National Hockey League (NHL). The NHLPA works on behalf of the players in varied disciplines such as labour relations, product licensing, marketing, international hockey and community relations, all in furtherance of its efforts to promote its members and the game of hockey. In 1999, the NHLPA launched the Goals & Dreams fund as a way for the players to give something back to the game they love. Over the past 14 years, more than 60,000 deserving children in 32 countries have benefited from the players' donations of hockey equipment. NHLPA Goals & Dreams has donated more than $22-million to grassroots hockey programs, making it the largest program of its kind. For more information on the NHLPA, please visit www.nhlpa.com. USA Hockey Inc., founded on October 29, 1937, and headquartered in Colorado Springs, Colo., provides the foundation for the sport of ice hockey in America; helps young people become leaders; and connects the game at every level while promoting a lifelong love of the sport. More than one million strong, including players, coaches, officials and volunteers that span all 50 states, USA Hockey is the National Governing Body for the sport in the United States and has important partnerships with the National Hockey League, United States Olympic Committee and International Ice Hockey Federation. For more information, visit usahockey.com. Renous, New Brunswick will host an NHL preseason game on September 18, 2019. He was once a tall, lanky kid looking to add some size and skill to his game. Mission accomplished for Brock Nelson. If you know anything about Vladimir Tarasenko, you know he's a family man. But what would he be doing if he wasn't scoring goals for the St. Louis Blues? Calumet, Michigan will host an NHL preseason game on September 26, 2019. Although Matt Duchene’s light on playoff experience, the Columbus centre is making the most of his third shot at the big prize. “He brings it every night," says Winnipeg Jets teammate Adam Lowry. "He’s a heart-and-soul player. I think he’s vital to our success."